Used Enderle nitro barrel valve assm. For the racer that is running a budget big show top fuel motor here is a great find that is becoming harder to find. Barrel valve is made from billet alum. that is hard anodized to protect against wear and corrosion. Inlet and outlet manifolds bolt on the so the racer can change if different plumbing applications are needed. Currently there is two -10 in and a -12 out. All fitting bosses are ORB for a leak free application. Barrel valve mounts with the industry standard two 1/4" holes and uses standard hex bar to hook up to injector arm. 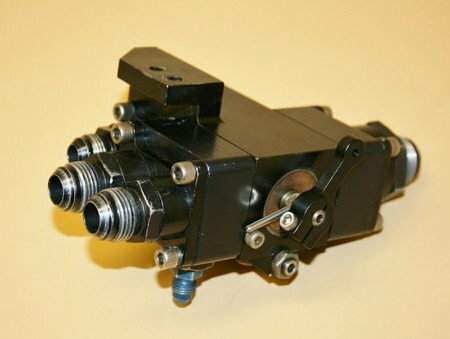 Perfect for thirty to hundred gallon fuel pump applications. Barrel valve is also popular in the A-fuel class.